Is this any way to run a nonprofit that claims to be driven by a philanthropic vision to “increase access to dental care for those who can’t afford it”? As a case from Kentucky shows, an exit agreement for a CEO is only binding if it is approved beforehand through the proper channels. A Citizen Board to Monitor High Nonprofit CEO and Board Compensation? In the state of Washington, a legislator has filed a bill to establish citizen monitoring boards to oversee the compensation of CEOs and board members of nonprofit health insurers. Where did 75,000 of patient advocacy Group US Pain’s members go? Left with 15,000 of a previously claimed 90,000 members, a similarly reduced social media following, a history of financial irregularities, and some odd 990 reports, this group was quite successful in pulling down money from opioid producers. Should the family foundation run by the CEO of a company convicted of environmental crimes be forced to pay for the necessary cleanup after the company’s sudden shutdown? The fact that the latest CEO makes $400 an hour as a trustee makes the setup look enticing. The founder of this nonprofit is simultaneously president of the board, CEO, and—until recently—CFO, and the website states that none of its own statements should be construed as a commitment. 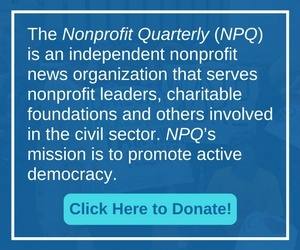 So, when is a nonprofit not a nonprofit? While women lead many nonprofits, the larger the organization gets, the less common female leadership is.